An App Entrepreneur? Get answers to the questions bugging you! Even if your app idea is paramount, it really takes a lot more than just putting up your app in the play store to be successful. Though mobile apps have been in existence for just under a decade, there is a cut-throat competition still, where each app is trying to prove its individuality with cutting edge technology. So if you wish to end up in a productive and profitable venture, you need to answer these questions prior to putting your step forward. There are myriad challenges an entrepreneur faces during mobile app development and ‘coding’ perhaps ranks the last on the list. Often, the entrepreneurs get bewildered at the thought that they do not know how to code and that might prove to be a restriction to the process. However, to be honest, seeking the services of a good app development firm can help you take care of the coding aspect quite well. The more imperative factors to worry about lie in the post development stage of the app, its marketing and formulating strategies to get a quick return on the investment. 1. How to Hit a Profitable App Idea? There is practically no formula to make a start-up or an emerging enterprise a success. The main point behind a successful start-up or an app is to have a brilliant idea. The way to actually start off with the idea is validation. An in-depth research will tell you if your app has a market and how the app’s future looks like. This is the first step to a successful business idea which ensures that you don’t end up spending thousands on something which has no market. 2. How Important is Validation of the App? There has always been a struggle to establish whether you should build a product in order to validate it’s worth or you should validate the concept of the product prior to actualizing it. However, the reality is that it all depends on the type of product and the competitive landscape around which it is being brought to life. In case of an app idea, if it is established as a second option to an already available concept, it needs no validation, since the importance and need of the concept already exists. But in case you want to float a new idea, validation is of the utmost importance. In the latter case, you can always pitch your rough idea on a sales page or on social media and see what kind and what volume of interest it generates. Once you are pretty assured of its existing demand in the market, you can go ahead with its execution. 3. Which Platform to Develop for? This question might come across like a prejudice against the RIM’s Blackberry or Microsoft’s Windows. However, the reality is you will hardly find a developer who finds it worth considering to develop for either of the above-mentioned platforms, other than Android or iOS. So, being a start-up or an upcoming entrepreneur, it is a very vital question which will for sure have a tremendous impact on the future and the success of the app and your business. 4. How to Assure that your App Idea Won't Face Dismissal? The next vital question is how do the upcoming entrepreneurs get the confirmation that their app will not face rejection due to myriad floating reasons in the market? Such reasons include copying existing functionalities of the available apps or due to the private frameworks or API blunders. Being a new entrepreneur, you need enough risk management backup as well as detailed research so that your app idea will not fall apart in this market of cut-throat competition. 5. How to Make Money? The most imperative and economical way to increase the ROI from an app is marketing or advertising and subscription services. However, new entrepreneurs are mostly not aware of the thousands of other available options to raise the money from their developed app. One of the most common ways to speed up your income is to secure a partnership with another established brand. This quite significantly ramps up your monetization. This can also prove to be a highly effective channel if you trace a partner with a similar base who shares similar experiences, all the more so if you are looking forward to creating an integrated experience. Apart from that, to survive and thrive in this competitive world, recognition and visibility is quite important. So social media should be your priority and you have to figure out which channel will fetch you the most potential customers. 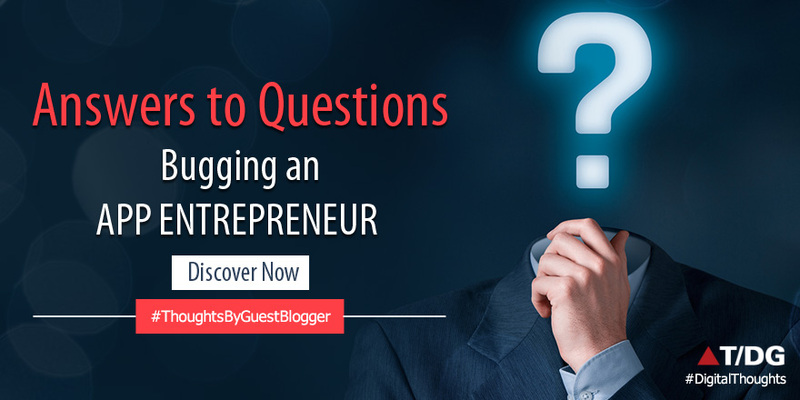 So, if you are a start-up with a brilliant idea or an upcoming entrepreneur with huge potential, you have to take care of the top imperative and unavoidable questions to get a rocket start followed by a huge success. Better be sure than just taking a leap of faith! Once you have the answers, the next step is to seek the services of a good app development firm who will take complete responsibility of your app, right from its conceptualization to making it live on the App Store or the Play Store. The Digital Group understands the significance of mobile apps to the growth of a business and provides mobile app development services across multiple platforms. To learn more about our services in this domain, visit https://www.thedigitalgroup.com/mobile-solutions/ or drop us an email on tdg-marketing@thedigitalgroup.com and our team will get in touch with you soon.